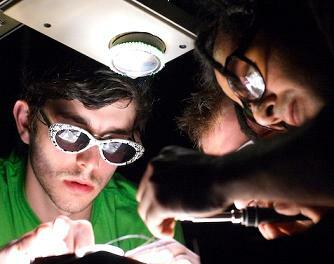 The Loud Objects (Tristan Perich, Kunal Gupta, Katie Shima, MySpace), wielding soldering irons over a ramshackle overhead projector, wire up live musical circuits, gerrymandering electronic noise. Monkey Town is a special space with surround projection screens in a square space with couches. At Monkey Town, the Loud Objects will be using three overhead projectors for the first time, flooding your perceptrons with electronics and noise. Building their sound machines live is something that has to be seen, plus the venue sounds hip!